Approximately 26 pieces per pound. Slice width is about 2 inches. Sugar, glucose, agar, citric acid, cottonseed oil, egg albumen, natural and artificial flavors, artificial colors (red #40, blue #1, yellow #5 and #6). Serving Size 3 pieces (42g) | Servings about 10 per pound. The fruit slices came in a few days and were fresh and delicious. Certain flavors are so good, they just seem to make people go weak in the knees. These Cherry Fruit Slices rank high on the list of treats that no one can resist. Chewy and delicious, with a full dusting of sugar crystals for extra sweetness, they�re just like the old favorites you remember�in fact, they are the old favorites you remember. 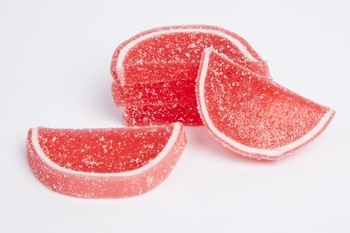 For nearly 70 years, they�ve been called Boston Fruit Slices and have been handmade in a New England candy kitchen by the one and only Boston Fruit Slice Company. From that first teeth-sinking bite down to the last fruity tingle, they�re as good today as they ever were. These luscious cherry-flavored gel candies are made using only the finest ingredients available, and contain no fat or cholesterol. The taste is reminiscent of homemade cherry pie filling: rich, tangy and satisfying, with a soft-firm consistency that keeps the flavor coming in waves as you chew. Our Cherry Slices have a deep red center and a pretty dark-pink �rind� separated by a thin white layer; they�ll look divine in any glass bowl or layered on a platter. Their vibrant colors and delicious appeal make them the ideal candy choice for weddings and anniversaries, Valentine�s Day treats, and many other color-themed events. Unlike store-bought versions (if you can even find them), our single-flavor bulk Cherry Boston Fruit Slices come to you at the peak of freshness, ready to serve and enjoy. You order them by the pound, with larger pack sizes available, so you can easily get the exact quantity you�ll need at the very best price. Order when convenient; fruit slices don�t require refrigeration, and keep very well in most indoor conditions. So, for your upcoming event, why not surprise your guests with these fabulous old-time treats that everybody loves? We guarantee these �candied cherries� will be the hit of the party!